I've been so focused on getting into Club 122 that I completely forgot that spring training takes place in Florida every March. In fact, it wasn't until after I had booked my flight to Tampa that I bothered checking the schedule for the ball teams in the area. 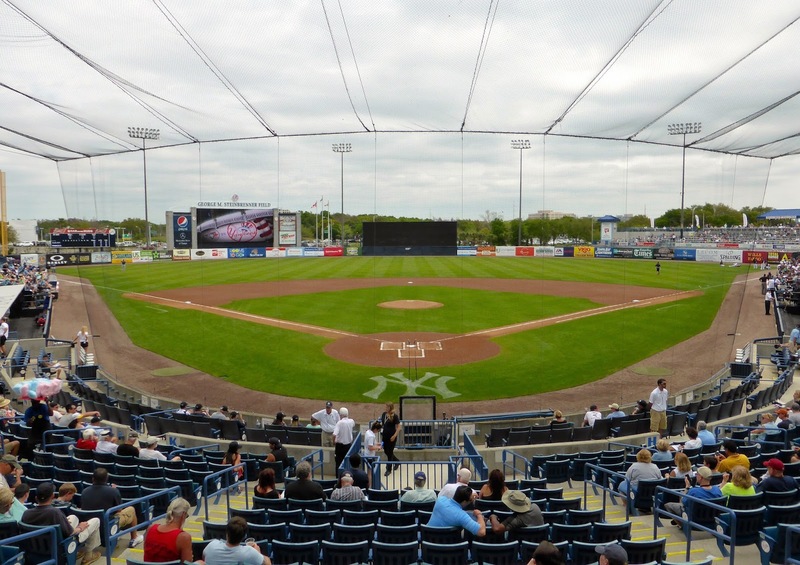 Luckily for me, the Blue Jays were visiting the Yankees on Sunday afternoon. 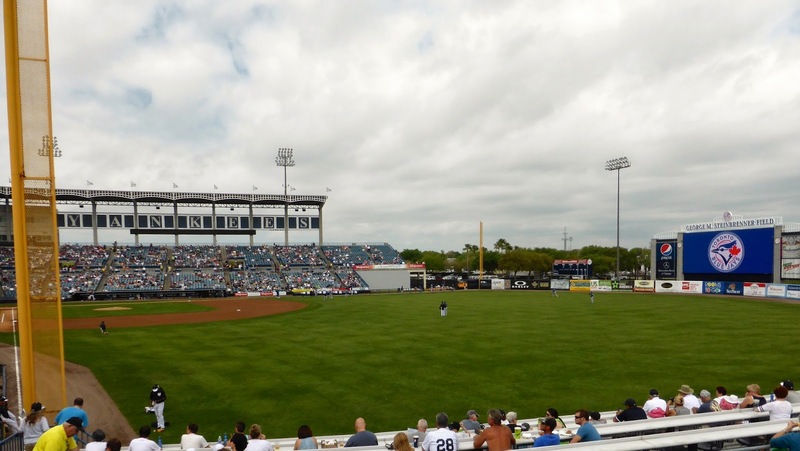 The Yanks play at George M. Steinbrenner Field, just a couple of miles from my airport hotel. Without a rental car for the weekend, we took a taxi instead. I was wearing my Blue Jays outfit and the taxi driver asked where I was from. I told him Toronto, and he asked who would win. Still in a funk over the Leafs' collapse, I glumly said "Yankees" but he laughed and said, "No, Toronto will win". He was right, at least for the game I went to; of course the Leafs continued their freefall down the standings, losing to New Jersey. But who cares about hockey, baseball is back! I visited here two years ago during my Florida State League tour, and won't recap the stadium, other than to note the difference in crowds. 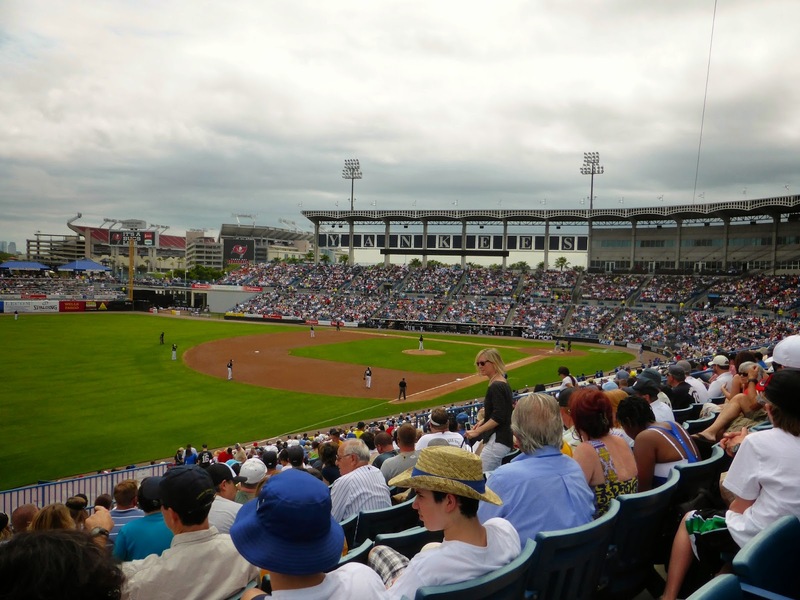 The FSL game had about 1,000 fans while ten times that number were in attendance on this day. Parking is only available across Dale Mabry Highway next to Raymond James Stadium and costs $10, exorbitant in my mind. This is still spring training! Most fans don't seem to care though as they are here on vacation and who can blame them. For those snowbirds who endured a tough winter, a spring training game is as good as it gets. Even with a few minutes before first pitch, most fans had taken their seats as you can see below. I managed to grab the last pair of seats on TicketMaster about two hours before game time, but there were still tickets available at the box office when we arrived, and a long line purchasing them. Not sure how that works but at least I paid face value; there were tickets on StubHub going for four times that. My advice is to buy tickets well in advance, at least for the Yankees. Our seats were well down the third base line, but at $17 (plus service charges, the bane of sports road trips) it was not overpriced. The weather was cloudy with the occasional sprinkle, but it beats New York right about now. We settled back and enjoyed a quick afternoon of meaningless baseball. Both teams started full major-league lineups, with the regular season just a week away. 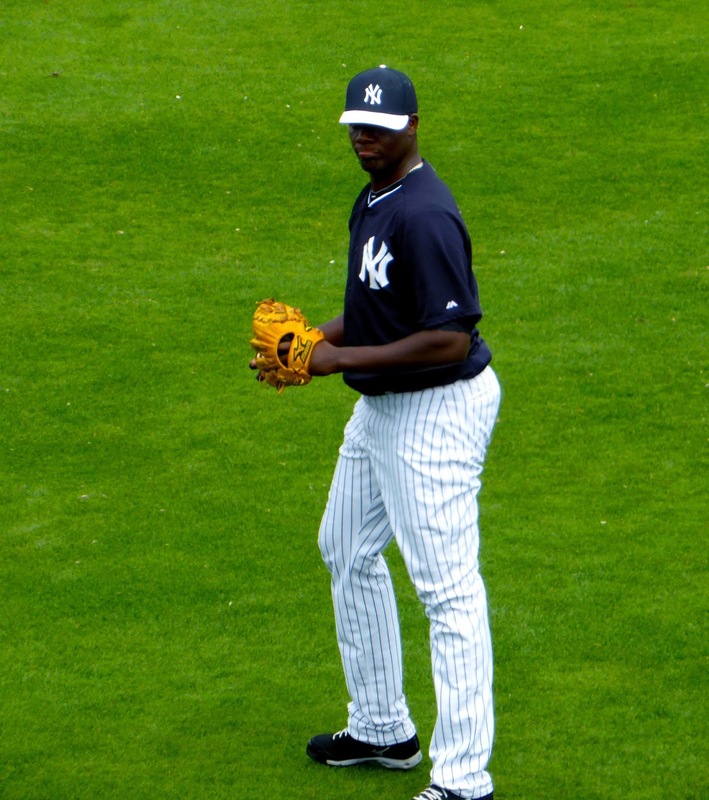 Michael Pineda (above), battling for the final spot in the Yankee rotation, got the start against Mark Buehrle. The fan favorite was naturally Derek Jeter (below) who is struggling in his final spring training. After an 0-4 day today, he is just 5-44, but as I said, this is meaningless. At least Yankee fans hope so. The Jays scored an unearned run in the second when Edwin Encarnacion reached on a throwing error by third baseman Eduardo Nunez. 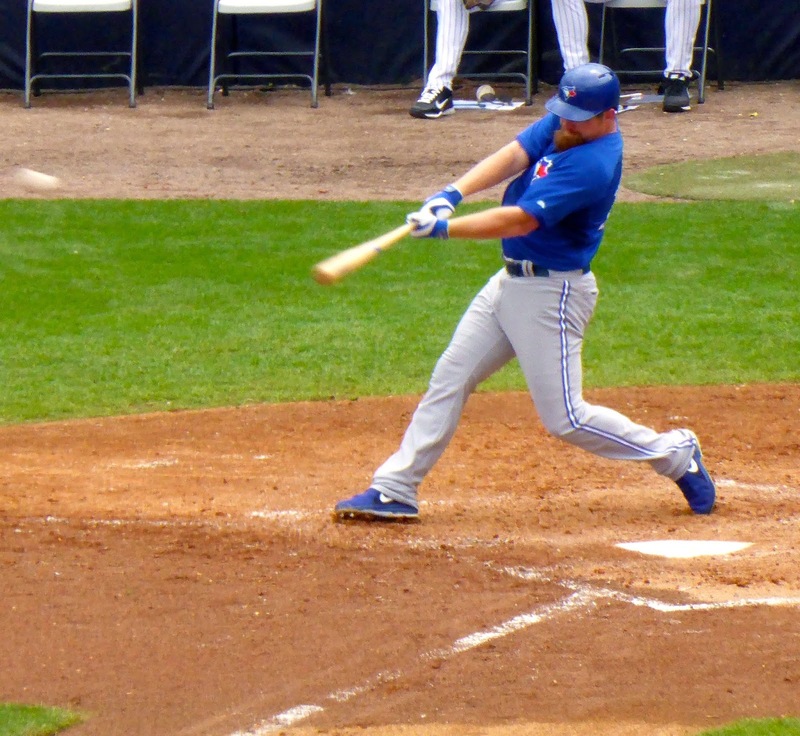 After Adam Lind (below) singled, Dioner Navarro followed with a base hit of his own to score Encarnacion. Another couple of Yankee miscues helped the Jays in the 5th. After Colby Rasmus and Brett Lawrie started with back-to-back singles, Ryan Goins laid down a great sacrifice bunt. Pineda threw wildly though, hitting Goins in the back as Rasmus scored while Lawrie advanced to third, from where he would later come home on a Pineda wild pitch. The Yankees scored their only run in the 6th off Buehrle. 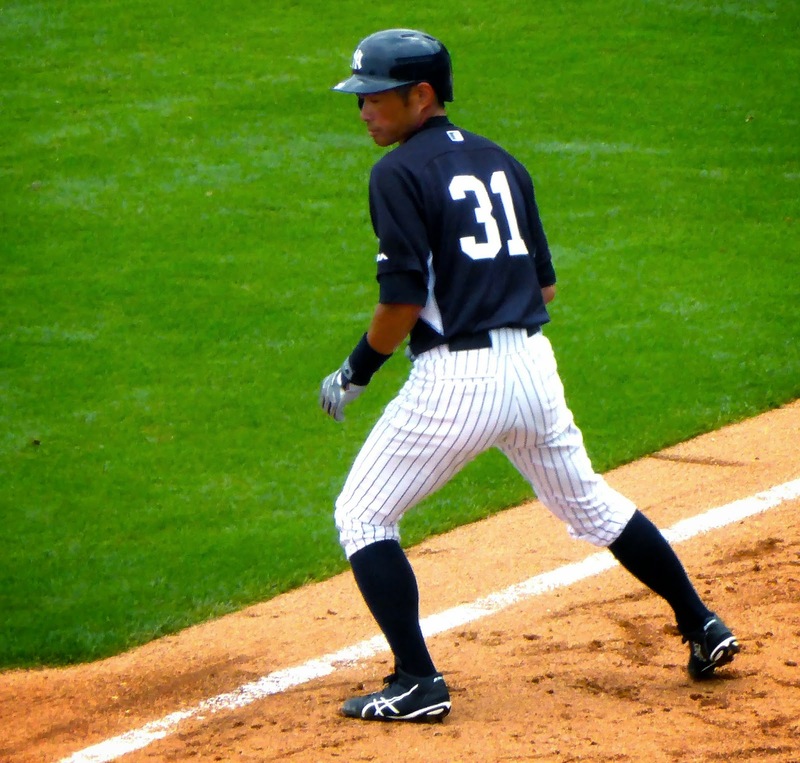 Ichiro (above) doubled to lead off and moved to third on a Brett Gardner single. Jeter grounded into a double play and Ichiro jogged home, giving the local fans something to cheer about. 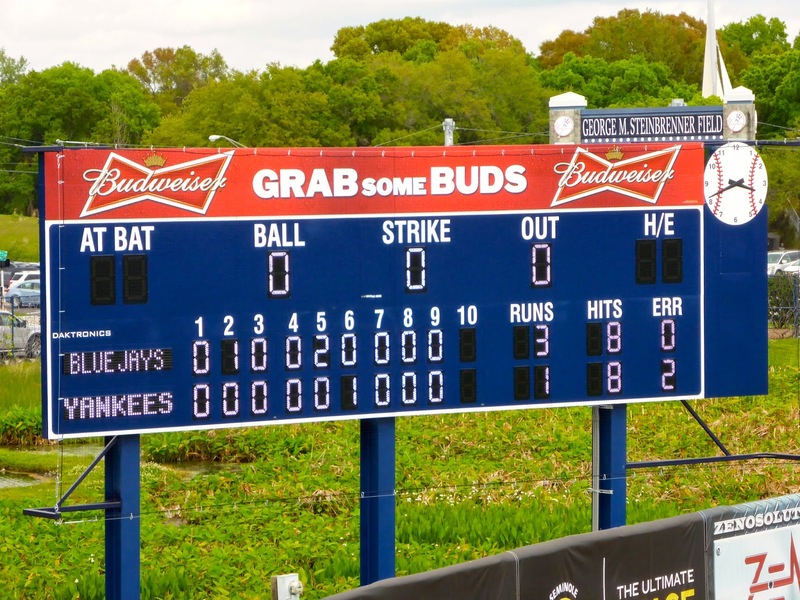 After that, most of the starters were replaced (you can see the Yankee lineup below) and the game was filled with numerous pitching changes. Neither team scored again and the Jays won 3-1. The game took 2:31, but I did not keep score, so I don't know how many pitches were thrown. Even ESPN and MLB.com don't seem to track pitches during spring training, but I was glad that Buehrle was throwing as he is among the fastest workers in baseball. Overall, a great experience but one that need not be repeated. 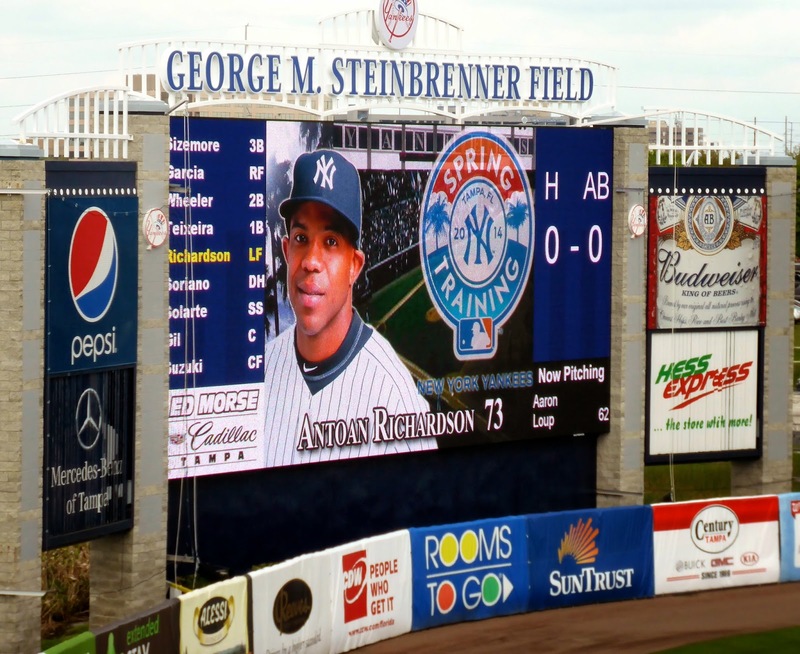 This blog began with a trip to Tucson in 2009, during which I saw my only other spring training game. 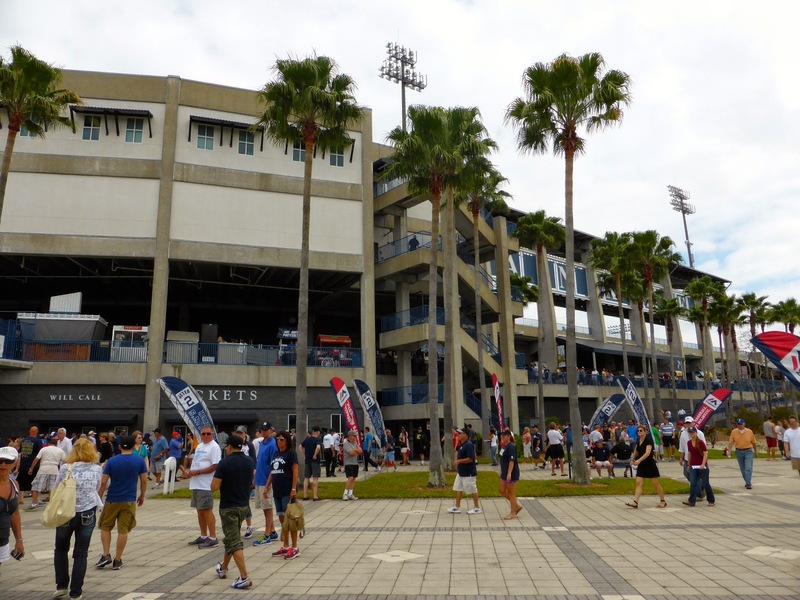 Having now added the Grapefruit League to the list, I doubt I will ever again set foot in a spring training facility; it is not the relaxing experience I expected, but much more like a major league game with parking charges and overpriced food, yet without the benefit of a major league roster. I'll be sticking with the minors for my baseball fix. From ESPN: three of the 23 major leaguers to pitch a perfect game were at Steinbrenner Field: Buehrle, Yankees spring training instructor David Wells and Yankees broadcaster David Cone. After the game, we took a bus back to the hotel and were rewarded by being dropped off directly in front of the Brickhouse Tavern and Tap, one of the better sports bars I've seen with quality food and beer and an atmosphere that keeps even non-sports fans entertained. Check it out if you are in town. A couple of days off as we make our way to the Big Easy for venue 121, the Smoothie King Center, home of the New Orleans Pelicans who host the Clippers on Wednesday. Check back after that for an update.